I have an exciting update for you all! Over the last year or so I’ve been collecting musical submissions from the community over at Starmen.net, and I’ve finally gotten around to implementing the tracks into the game. With over twenty new pieces of music now embedded into the game’s world, Unearthed is starting to sound preeeeeetty goooood. Here are a few of my favourite tracks, composed by the incredibly talented DalisClock. There still are a few new (wicked awesome) battle tracks I need to implement, but I will be taking care of those when I tackle battle backgrounds later in the year. For now, I’m going to be doing some good ol’ fashioned debugging ahead of my Twitch stream, which will likely be taking place in February. This rom is gonna be sooooo cool! Hey! It might even become and actual GAME. Just make some sprites and coding stuff and then, *POW! * Game! Thanks! I hope that, one day, Unearthed will be a fun game that cool people play… not just bits and pieces of sprites and code that I’ve scattered about the blog. Sounds to me like you’ve got quite a lot done! What is there left to do? Quite a bit, actually. I’m currently working on adding some new battle backgrounds, then I have quite a bit of troubleshooting to do. 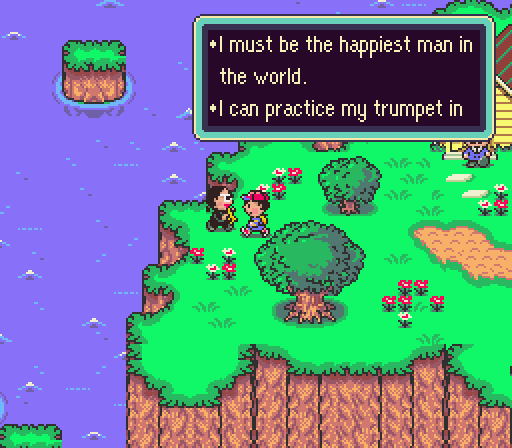 Im just discovering the world of hacked roms….ive played and beat earthbound dozens of times over the years and im sooo looking forward to this…keep us poted! !